Let that sink in, “keeping with the highest traditions of the U.S. Air Force.” His extraordinary heroism is a somber and powerful reminder for all Airmen of what it means to serve in our Air Force. Here at the Air Force Academy, where Sijan Hall bears his name, his example is an enduring reminder that inspires and epitomizes the Long Blue Line. Captain Sijan’s story should also remind each of us, cadets and permanent party alike, of the gravity of what our graduates will do and that they must be ready for the challenges that await when they leave our campus. Less than three years after throwing his hat in the air in Falcon Stadium, Captain Sijan was alone in the jungles of Laos fighting for his Nation and his life. I talk a lot about warrior ethos, and this is why. Captain Sijan’s honor, courage, and indefatigable will to prevail define the fundamental character of what it means to be an Airman. As we prepare our cadets for the modern profession of arms, his spirit must reverberate across our campus. His legacy must never fade. While Sijan’s story exemplifies the traits of a warrior, we also have examples of those traits closer in time and location…right here on our campus. Among our AOCs, AMTs, faculty, staff, flight instructors, permanent party, and coaches are those who have experience on the modern battlefield. They are coming from the fights we now face, and those that our cadets will enter in the near future. I encourage you to share your own stories with our young leaders, including those difficult ones of sacrifice, loss, and hard lessons learned. Our close connection to the current fight, though as far removed as we might seem here in Colorado Springs, must be made a reality for our cadets. 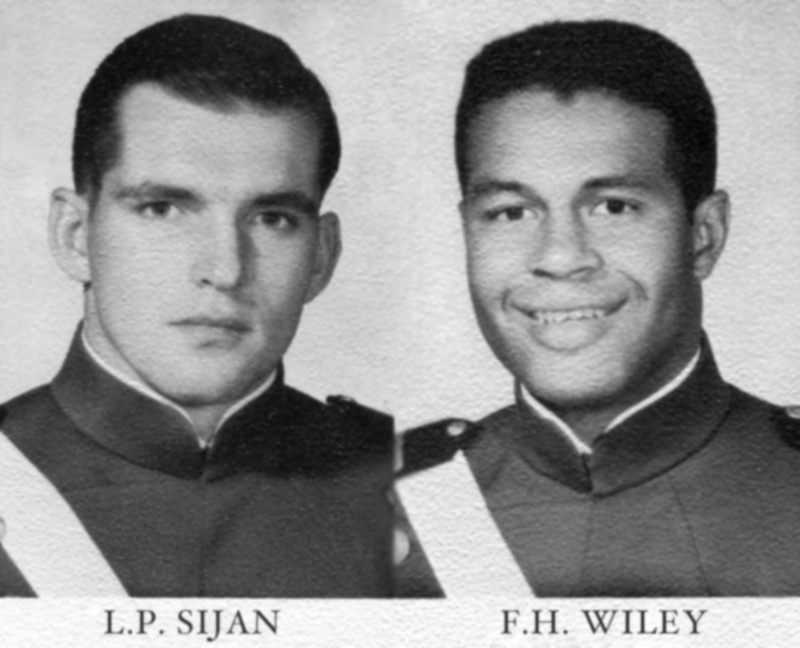 When he graduated in 1965, there is no doubt Captain Sijan was prepared to fight and to lead. So too must there be no doubt about the Class of 2018, and every class of graduates thereafter. Thank you for joining me in reflecting on Captain Sijan’s uncommon courage, and for honoring the legacy of those who have bravely served our Air Force. With a daughter who desires to attend a military academy, I took her this past week to visit the Air Force Academy. While touring the grounds and facilities, I passed the MOH portrait of Captain Sijan and was struck by how handsome he was and by his presence and military bearing, verified by all that knew him, and that the artist captured so well. Furthermore, his evident selfless service to his country and love of those he served with is an example of the best that America has has to offer and indeed is the kind of example that we Americans should honor and never forget. Thank you Lance and the Sijan family for you service and sacrifice. A long time ago, I lived for a time in the company of heroes; men who endured great hardships, but who refused to lose faith in their God, their country, and their comrades. I am a witness to a thousand acts of compassion, sacrifice and endurance. But of all the men whose dignity humbles me, one name is revered among all others. I never knew Lance Sijan, but I wish I had. I wish I would have had one moment to tell him how much I admired him; how indebted I was to him for showing me, for showing all of us, our duty; for showing us how to be free. I lived alone once in a room next door to men who had once lived with Lance Sijan. He was gone before I heard of him, but the men who had lived with him told me his story. 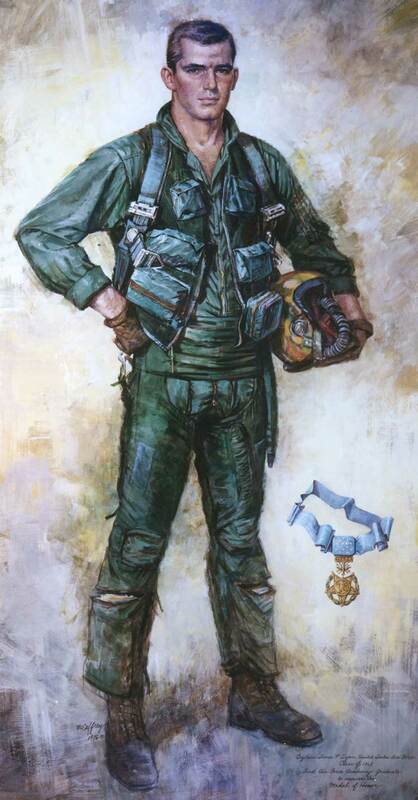 Air Force Captain Lance Sijan was shot down near Vinh, North Vietnam on November 9, 1967. For a day and a half, he lay semi-conscious on the ground, grievously injured with a compound fracture of his left leg, a brain concussion, and a fractured skull. He made radio contact with rescue aircraft, but they were unable to locate him in the dense jungle. On November 11, they abandoned the search. Crawling on the jungle floor at night, Lance fell into a sinkhole, injuring himself further. For six weeks, he evaded capture. On Christmas Day, starved, racked with pain, he passed out on a dirt road, where a few hours later the North Vietnamese found him. The Code of Conduct for American prisoners of war requires every prisoner to evade capture, and, when captured, to seize opportunities for escape. It instructs prisoners to resist giving the enemy any military information beyond name, rank, and serial number. Lance Sijan obeyed the Code to the letter. A short time after he was captured, he overpowered an armed guard and managed to escape. Re-captured several hours later, he was tortured for information but refused to provide anything beyond what the Code allowed. By the time he reached prison in Hanoi, he was close to death. Over six feet tall, he weighed less than 100 pounds when he was placed in a cell with two other Americans, Bob Craner and Guy Gruters. He lived there barely a month. In and out of consciousness, often delirious, he would push on the walls and scratch the floor searching vainly for a way out. When he was lucid, and not consumed with pain, he would quiz his cellmates about the camp’s security, and talk with them about escaping again.Interrogated repeatedly, he refused to say anything. He was savagely beaten for his silence, kicked repeatedly and struck with a bamboo club. His cellmates heard him scream profanities at his guards, and then, after hours of torture, they heard him say in a weak voice: “I’m not going to tell you anything. I can’t talk to you. It’s against the Code.” His cellmates tried to comfort him during his last hours. Working in shifts timed to the tolling of a nearby church bell, they cradled his head in their laps, talked quietly to him of his courage and faith, told him to hang on. Occasionally he would shake off his delirium, and joke with his friends about his circumstances. Finally, near the end, the guards came for him. Lance knew that they were taking him away to die. As they placed him on a stretcher, he said to his friends, “it’s over . Finally, near the end, the guards came for him. Lance knew that they were taking him away to die. As they placed him on a stretcher, he said to his friends, “it’s over . .. it’s over.” A few days later, the camp commander told Bob Craner what he knew already, that his friend was dead. And Bob, a good man and tough resistor himself, resolved to spread the legend of Lance Sijan throughout the prisons of Hanoi so that his fellow Americans could draw strength from the example of a man who not yield his humanity no matter how terrible the consequences. A few weeks later, when I was moved to the cell next to Bob’s, he told me the story of Lance Sijan: a free man from a free country, who kept his dignity to the last moment of his life. When you leave here today, think of Lance Sijan, and carry his dignity with you. Keep his memory alive, confident in your faith that almighty God blessed him, and gave him the strength to prevail over his enemies. Though they took his life, they could not take his dignity. My husband S/Sgt. U.S.M.C. 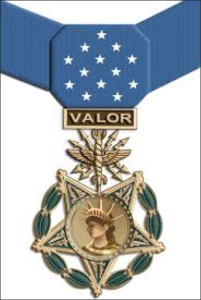 ( deceased) was a recipient of the Lance Sijan USAF Leadership Award. Being third generation Air Force and a Survival, Evasion, Resistance, and Escape Specialist for the past seven years, Lance’s story resonates with me in a very meaningful way. 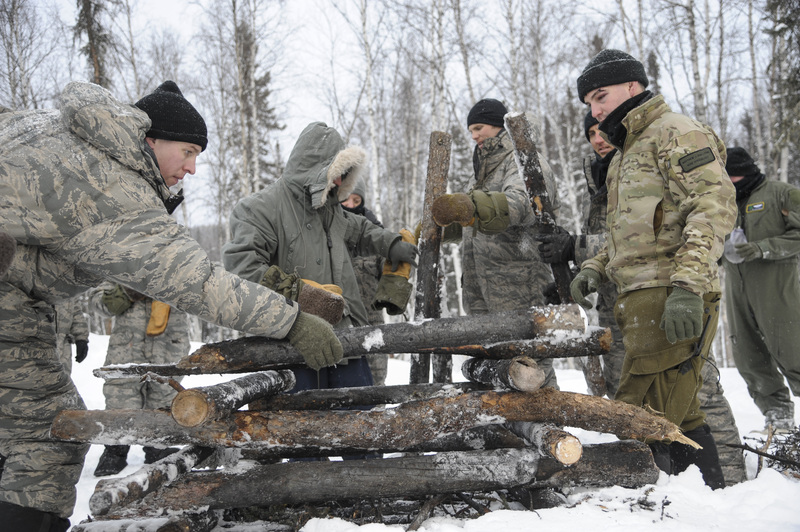 I’ve had the privilege to instruct hundreds of high risk aircrew and thousands of USAFA cadets in Combat Survival Skills. During this time, I’ve always told Lance’s story and to be honest…I’ve gotten real good at it. I’ve silenced a crowd of a hundred people during the motivational speech, usually given after the field exercise. I’m passionate about the story, so much so that I get goosebumps and get choked up re-telling it, and I can see the real emotion in the students also. I wanted to let you know the impact that his life had on mine, and that I’ve been able to pass to others. I was a Civil Air Patrol cadet from 1992-1998 at Mitchell International Airport and saw your brother’s jet at the entrance to the 440th all the time. I feel proud to have known his history and legacy and think of him whenever I see Sijan Hall at the Air Force Academy. I live in Colorado Springs and fly C-130’s for the Air Force Reserve now and I wanted you to know that his jet holds a special place in my heart. I’m not sure if I would be who I am today without seeing that jet every week for years. It was the spring of my freshman year at the Air Force Academy. Finals had been taken, seniors were preparing to graduate, and everyone was looking forward to being one year closer to leaving that place. I’d had a rough year myself. I was fighting accusations of an honor violation, which eventually got dropped, I was barely keeping my head above water academically, my military ranking wasn’t very high and I was beginning to wonder why I decided to join the Air Force anyway. Everywhere I looked, there was something telling me that I wasn’t good enough. I wasn’t measuring up. I was jaded as could be and couldn’t remember why I even wanted to be in the Air Force. It was 20 minutes before Retreat and I was walking down the stairwell that was right outside my room. Ironically, I often left 20 minutes before retreat so that I could avoid getting stuck outside in the Colorado cold at present arms or attention. I didn’t know, that today, it was meant for me to leave 20 minutes early on that particular day to meet one particular person in one particular place. I couldn’t tell you how many times in basic training we’d learned about the downed Vietnam War pilot Capt Lance P. Sijan; how he refused to be rescued and put others in harm’s way for his sake, how he evaded rescue for over a month until he was captured, how he endured torture until passing away, having never given away information to his captors. I had lived in Sijan Hall for 10 months and passed that life-sized portrait of Lance Sijan countless times. I never thought in a million years that here, I would meet his sister. I was completely speechless. All I could do was hug her. We sat down together at the top of the stairs and Janine told me about her older brother Lance. He was sweet, gentle and caring, she said. She was so proud of him and what he did. After talking for a while we began to exchange phone numbers. Then, Retreat sounded. We both stopped what we were doing and held each other facing the flag that showed through the glass walls of the hall. There I was, standing in Sijan Hall in front of Lance Sijan’s picture holding Lance Sijan’s sister as the flag went down and the National Anthem played. It was like the Air Force was giving me this big, awesome hug! For the first time in several months, I was so proud to be an Air Force cadet. Janine said that she would ask Lance to be my guardian angel. It’s so easy to get caught up in stats and lose sight of The Big Picture. Perhaps, before basic training, before we knew what an OPR or EPR was, the tips and tricks of how to look good to your superiors or how to ensure you get promoted to the next rank, the reasons for joining were so much simpler: to help people, to serve our country or to honor a legacy. When I looked at Lance Sijan’s picture with new eyes that afternoon, I was reminded of what it actually means to serve in the United States military. Early on, he wasn’t exactly considered the shining star of achievement when it came down to the stats. Like me, he was put on academic probation for low grades. At one point, he was on the verge of being kicked out. However, when it came down to what was in his heart, he had what it took to do what was right for the good of his country and his wingmen. As we progress in our Air Force careers, whether you decide to spend 5 years, 20 years or a lifetime in service, I invite us all not to focus on the stats attached to our name, but on what’s in our hearts. In whatever you do, make sure your heart is in it. In preparing this story, when I searched “Lance Sijan academic probation” on Google, I couldn’t find a thing. All that comes up are various iterations of his story, praises of his bravery and selflessness, awards made in his name and the names of the family he left behind. The world won’t remember us for our performance report bullets, quarterly awards or how quickly we made rank. They will remember us for caring about people, for standing up for what’s right when no one else will, for performing our job with excellence simply because it’s the right thing to do. I believe that if we focus on these things, everything else will follow. My guardian angel helped me see that. Late in 2015 I had the absolute honor of serving as the Historical Consultant for a professional sculpture that honored USAF 1st Lt. Lance P. Sijan, and displayed at the Plaza Of Heroes, at the Air Force Academy in Colorado. 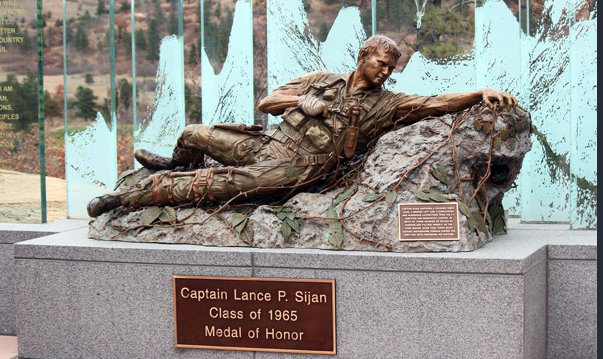 Sijan is the only Graduate of the Air Force Academy to have been awarded the Medal Of Honor. This amazing sculpture represents Lance crawling along jagged limestone Karst rock in Laos, after his aircraft went down on 9 Nov 1967. After 45 days of evading he was captured, and in spite of terrible injuries, Lance displayed total and utter resistance to his captors, revealing nothing of value. He tragically died of his wounds on 22 Jan 1968. It was my utmost privilege and honor to have contributed a small part to this amazing and superb tribute to the Bravest of the Brave, Lance Sijan. It all began several years ago when I was driving by the memorial to Lance P. Sijan on College Avenue just south of General Mitchell International Airport in Milwaukee, WI. 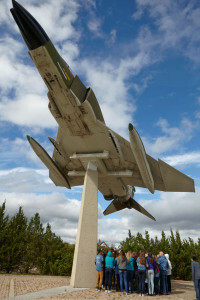 The memorial to Lance Sijan had a F-4C Phantom on a pedestal as well as a small written memorial that gave an account of the heroism of Lance Sijan. I had driven by the memorial numerous times but on this day I decided to park my car and walk over to see it up close. I was amazed at the size of the plane and even more amazed at the account of Sijan earning the Congressional Medal of Honor. I also noticed that the surrounding memorial area had grass growing through the bricks and that maintenance of the site appeared to be subpar. I drove away thinking that the plane looked “lonely” and needed to be moved to a more accessible location. Then I had a brainstorm. Why not get the F4C moved to the playground of the school where I was principal? It would not only serve as a memorial, but students and families would have access to it every day and students could learn an actual history lesson. Somehow, Jim Stingl from the Milwaukee Journal-Sentinel got hold of my pie-in-the-sky quest and decided to interview me for his newspaper column. Following publication of his column, I received some favorable reactions as well as some negative reactions. Some people accused me of being a warmonger and that a war machine shouldn’t be anywhere near a playground. I explained that the plane represents nothing to do with war but the honoring of someone who gave his life and exhibited the utmost courage in the face of horrible conditions. Then a great thing happened. Jim Stingl put Janine Sijan-Rozina, Lance’s sister, and myself in contact with each other and events took a totally different direction. It turned out that she was working to have the plane moved as well, so we set up a meeting to discuss how we could work collaboratively together and use this effort as a project of support with the eighth students at Burdick School in Milwaukee, WI. Over the last several years, the eighth graders at Burdick School have engaged in a project called the “Lance P. Sijan Project”. This project studies the life and Air Force career of Lance P. Sijan, a Milwaukee Bay View High School graduate who’s aircraft went down on November 9, 1967, over Southeast Asia. The eighth grade Lance Sijan Project includes reading “Into The Mouth of the Cat”, a book about Sijan’s ordeal, a field trip to the 128th Air Refueling Wing at Mitchell Field where Sijan Hall is located, a visit to a memorial which contains a F4C fighter jet which Sijan flew, and a visit to his grave and memorial at Arlington Cemetery. The day is concluded with a lunch and visit with Sijan’s sister who also comes to Burdick and talks to the eighth grade students about her brother. The 8th grade class will be addressed at their graduation ceremony by Guy Gruters, a fellow cellmate of Lance at the Hanoi Hilton on June 10, 2016. The effort to move the plane to a location near the entrance of Mitchell International Airport is gaining traction and more support. Janine continues to work tirelessly to see her dream come true and my eighth graders continue to be supportive and very involved in The Lance Sijan Project. I hope to see this new memorial come to fruition in the near future as a remembrance of what it means to be a true hero. I am forever indebted to Mr. & Mrs. Sijan for my copy of Into the Mouth of the Cat. I grew up around aviation and loved military airplanes, but until I knew the story of Lance Sijan I didn’t understand courage. In the mid 90’s I was in middle school and having recently read Into the Mouth of the Cat, I talked my Dad into taking me to the dedication of the F-4 at the 440th in Milwaukee. It was there I realized that Lance Sijan had been a pretty normal guy at my age. A normal Milwaukee kid, raised by strong parents with the right values, athletic, smart-enough to get into and through the AF Academy, but not super-human. Then, in the worst of times, he chose to be the toughest and most courageous fighter pilot and officer we can imagine.20 years later, 14 years from Milwaukee, 10 years from the AF Academy, flying fighters halfway around the world, I know that in the worst of times I can find inspiration and courage from the unwavering example set by (then) Lt Sijan nearly 50 years ago. My charge to anyone interested in the story of a normal Milwaukee man’s decisive courage is to read Into the Mouth of the Cat. Visualize the moment-to-moment decision making of a man in distress and the Sandy Pilots, Jolly Pilots, Nail FACs, and other SAR forces risking themselves to return their brother. My eternal thanks to Capt Sijan, his family, and those who guard our country and our way of life…and are willing give their life in its defense. I never knew or met Lance. I was ‘loaned’ a copy of his book “Into the Mouth of the Cat”, started reading after dinner one evening and could not put it down ’til I finished it much later that night (actually next morning). I was amazed by what he went through! Everybody should read this book to find out about his story and his unflinching dedication to duty and his bravery! 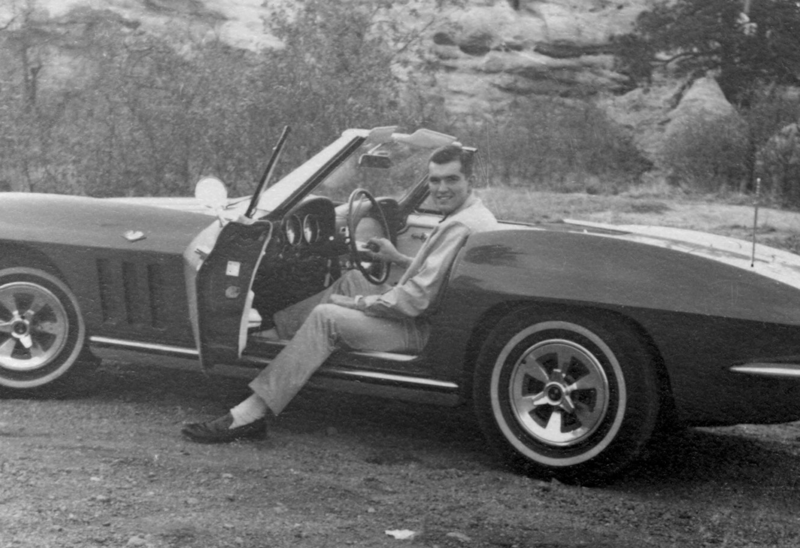 He (and the Corvette) will be our honored guests at our June 2016 Car show. Below is a story about an aviator that I always think about on Father’s Day. 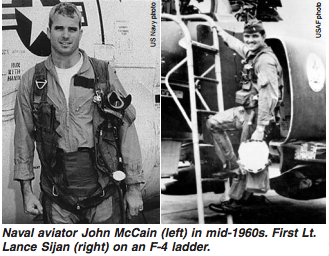 Sijan’s name and story are well-known to many aviators, particularly people who served in the USAF. However, there is one small part of the story that always comes back to me on Father’s Day. If you have not heard of him, take a few minutes to read his story on Wikipedia at this link: http://en.wikipedia.org/wiki/Lance_Sijan It is a small introduction to the life of a man who had willpower and bravery seen in perhaps one out of a million people. In the past 20 years I have passed through Mitchell airport in Milwaukee many times. Without fail, I always go to the little museum upstairs. There is a lot of good aviation stuff in there, but I go in to look at only one thing. In the back there is a small glass case with a few items from Lance Sijan. Milwaukee was his hometown, and someone carefully and lovingly put together this small case to house a few things from his brief life. I would like to tell you that I find Sijan’s story inspirational, and that returning time and again to the glass case is uplifting, but I don’t feel that way. For reasons that are difficult to explain, I have the profound feeling that I could understand something very fundamental about the value of human life if I just looked close enough with an open mind and heart. To me Lance Sijan was the human embodiment of pure, un-alloyed courage. When I was much younger, I thought mostly of his heroic actions, but I came to understand that his death was a tragic loss, not just for our country, or the USAF, or his fellow airmen, but particularly for his family. This change in perspective came from reading the memoirs of the two airmen who were present on Sijan’s last day. This single sentence humanized Lance Sijan. Prior to knowing this, it had been much easier, and frankly convenient for me to think of him as a super human hero. Putting people in such a category insulates us from having to really consider their suffering and courage. Coming to understand Lance Sijan as a human being, understanding that he had the same loves and fears as all of us, and that he had no special immunity, forces us to contemplate his real suffering, and the courage that it took to never give in to his captors. He was not granted heroic qualities at birth, he was made of the same material as the rest of us. What made him a real hero is the courage he was able to summon and the willpower he brought to bear. In the past 20 years, I have not passed a single Father’s Day without thinking about the last words of Lance Sijan. I think they are the most profound expression of the bond between fathers and sons. Many sons, even ones of incredible courage, have wished only for the presence of their Father when they reach the limits of human endurance. What allows some sons to exercise indomitable will and pure courage? Where do such people come from? I have looked into the little case in Milwaukee many times over the years, but I have never found an answer. It remains a mystery, and I can only offer my humble awe at the courage of a son who died with a last wish to be with his Dad, 44 Father’s Days ago. Lance Sijan’s parents at his grave. I found this photo in a Serbian newspaper. His family roots were from Serbia, and to this day he is regarded as a heroic figure there. His father Sylvester died Friday, September 9, 2011, age 92 years. – He outlived his son by 43 years. Lance’s story to me can be best summed up in one question, how does one define a hero most? Lance Sijan was not an action hero nor was he a Greek God or deity, he was a man. His story and his life have left an indelible mark on mine. His story of perseverance and courage and faith and heart has touched me dramatically. Lance Sijan taught me that we can all be so much more if we can just apply ourselves and stick to what we know is right. To feel a kinship with a man I had never met is an incredible feeling and I will try my hardest to never forget the lessons that this man taught me. He set the bar very high and his legacy is one of bravery, honor and love, and I would hope that it will never be forgotten. May his praises be sung for eternity. It’s a sunny day on Lake Michigan. I’ve never seen Lake Michigan but I know he’s there. He’s not swimming—not yet. First he’s twirling his much younger little sister Janine, his hands under her arms, her small feet gliding over the waves, and then he tosses her as she sings in delight into the warm blue water. Then she says “one more time,” and instead of swimming, he twirls her one more time. I love my cousin Lance because he lived love so completely, so fully, that nearly 50 years after his death, his adoring little sister spares an important part of her very busy life attempting to share him with everyone she possibly can. Because she knows his life was immeasurably important– not because he died a hero’s death, but because he taught her, even before she was a teenager, everything she would ever need to know about how to love family, friends, colleagues, comrades and, perhaps, even foes. When Janine Sijan Rozina, my cousin, asked me to write something for Lance’s website, I considered doing so from many angles. I have proclaimed myself to be a pacifist my whole life, but I was never put to any test. I never believed what he believed about the importance of the Vietnam war. I have, for years, felt sorrow that he believed it was important to serve in the military. But I humbly concede, on the other hand, it has been easy for me to be grateful that soldiers so incomprehensibly bravely smashed their way into the pathetically armed compounds of Saddam Hussein and Osama bin Laden and put an end to such diabolical greed and pointless violence. Lance’s story has tested ME. Janine’s love for Lance seems as fresh and poignant today as it must have been 50 years ago. It has grown in intelligence, in scope, in curiosity. This is the most remarkable tribute to his real essence than any I can imagine. She couldn’t have done it alone. She has had an angel with her all along. An angel giving her courage. Imagine how it can be that from the young age of 13, and every hour of every day between 1967 and today, Janine Sijan has found the courage to find love despite the deepest imaginable hatred of what was done to her brother. She has dared to imagine, not once but through repeated tellings by Lance’s fellow prisoners, the horrors her brother met with seemingly endless valor. Imagination is a potent force. I have no doubt that in many ways, Janine has been in that jungle with her brother. He too had an angel, and it was his little sister. In my 60 years I have learned to see that time can fold over upon itself. Lance was not alone in that jungle: he had his angel. Janine has faced a thousand hurdles and never has she been alone: she has her angel. Her consideration of her brother’s acts of courage have been distilled to reveal the one miraculous essence that gives more e’er it is spent: love. Only love will convey anyone to immortality. What we remember of diabolical figures will be forgotten except as paste-up pictures that represent but can never reveal. There is finally only one reason his memory will endure generations beyond this one. It is that Lance Sijan was, is, and ever shall be a spring of revelation about love. 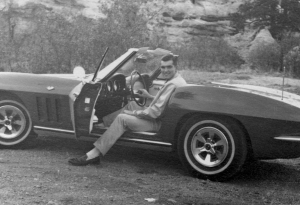 I only came to know the extraordinary life of Captain Sijan after being “discovered” in September 2015 as the 4th and current owner of his 1965 Corvette convertible. I’ve owned the car since 1996. It spent its first 19 years in my possession in California, where I restored it over a 7-year period from 1999 to 2006. The Corvette and my wife Deb and I returned home when we sold our house in California and moved back to Wisconsin in October 2014 after 35 years in the Golden State. I knew from the oral history passed down from my friend Steve, from whom I purchased the car, that it was first owned by a person that did not return from Vietnam. But Steve bought the car in 1972, before the full story of Captain Sijan’s heroic story was known. In the time I owned the car, I always wondered about the 1st owner. A little of his character was revealed in the car’s specification. Although classically styled and artistically beautiful in red over a rare white and red interior, it was built with only the minimum of options, and all those being the absolute best for a fast, reliable street sports car. It has the highest torque engine built that year with low maintenance hydraulic valve lifters. It is rated at 300 HP, but with a high 360 ft lb of torque at a very low 3200 rpm. The torque was even higher and peaked at lower RPM than the vaunted “Fuelly” 375 HP option that year. And at $53.80 cost, 1/10 the option price of a Fuelly. 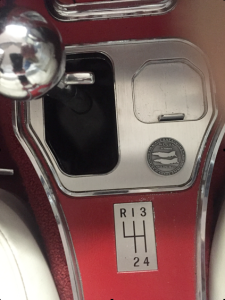 A wide ratio four speed transmission came with the 300HP option, with the first three gears lower than the also vaunted close ratio four speed, and much better for street use. It has limited slip “Positraction” rear differential for power distribution to both rear wheels and acceleration traction. No power brakes, steering or windows added. And of course, no hardtop or air conditioning was selected; hey the thing was going to be driven like a sports car with the top down. Since learning the story of Captain Sijan through reading “Into the Mouth of the Cat” and speaking to Janine over the last few months, I am really inspired by his life. I’ve always tried to be a stalwart guy, like my Dad was, but I now have an honorary older brother to look up to in that regard. And one of his memorial military “Challenge” coins, given to me by Janine when she came to see the Corvette in December 2015, rides with me on the console. It is incredible to me that I never knew the Lance Sijan story until I began researching a book a few years ago. The book is an examination of lives of Serbs who have had a great impact in the wider world, and Lance’s story seemed to have been lifted directly from the pages of Serbian myth. In Serbian oral tradition, which marries history with myth, the heroes are larger than life, incredible in their strength, power, and example – Supermen. And yet here was a man who’s feats of heroism and courage were clearly in the realm of myth, almost unimaginable. But he was just a man, a young man at that – and this I thought was the lesson in Lance’s story. Lance was a man, flesh and blood, with real hopes, real fears, and real dreams. He was a man who liked girls and cars; who worked hard, and played hard with his family and friends; a man who strove to become a warrior, and also to perform the lead character in his high school musical. Lance was a man who through the power of his will, his character, his belief, was able to achieve things one would expect only possible of a mythic hero. The foundation of that man, and his achievements, was the fertile soil that nurtures and feeds every great dream, every great man or woman: his family. As I delved into Lance’s story I got to know the devoted and respectful son, and the sweet tempered, and loving brother. I was left imagining the husband, the father, the foundation of his own family, that Lance would never have the opportunity to become. So many emotions are brought up in me by Lance’s story, and sadness at its untimely and early end is certainly one of them. But the overwhelming emotions I feel are of pride, and love. And determination. For at its most fundamental point, the story of Lance Sijan teaches me what is within the realm of possibility for any man or woman who works diligently, strives mightily, and refuses to quit. Greatness. Heroes are not born, they invent themselves. Lance and I were in the same squadron at the Air Force Academy for three years. He was a magnificent example of manhood. During that time, he was always a friend, the one that could be counted on for any help needed, not just in my life, but in the lives of all who knew him. This is why the experience in North Vietnam was so devastating. It was crushing to witness his physical death in such excruciating agony. However, at the same time, the slow death of his body by cruel and relentless torture was crowned with what I believe to be the greatest triumph of the human spirit, by far, that I have ever seen or been made aware of. I have never been impressed by myself or any other human being since. I sincerely believe Lance set a mark that can never be equaled. God gave us a perfect example of fierce loyalty and unwavering honor unto death, with no excuses and no complaints. I am from the Milwaukee area. I learned about Lance and his story when visiting the Air Force Academy in middle school. I was struck by his patriotism, character, commitment to duty, perseverance, heart, service and ultimate sacrifice for the freedom and protection of others. I read Into the Mouth of the Cat and visited the Vietnam War Memorial in Washington, D.C. where his name is etched in stone. His story is inspirational. More important, it is an incredible touchstone for all of us to remember. He lived his life for God, family and country. He lived it for others. I believe that is why he was able to find within himself the strength to persevere even when it meant facing significant trauma and loss of liberty and ultimately his life. Lance represents all that is good and great about America and its freedom fighters. I am proud and thankful to call him a role model. I thank his family and fellow service members for sharing his story so others may benefit from his extraordinary example and exceptional spirit. That spirit will never die because it lives in others, thanks to him and to them. One sunny afternoon during our senior year at the Academy, I bumped into Lance; and after making some light talk about the days winding down until graduation, he invited me over to Fairchild Hall (the Academy Academic Building) to see some of his art work. It also seemed so unusual for Lance — a stalwart warrior waging constant battle with the Dean to master the challenging and complex basic Air Force Academy curriculum — to find time in his busy schedule to take a course purely for the pleasure it gave him. And no wonder. He was very good at it! Some classmates that didn’t know him better also thought it ironic that a “bruiser” like Lance (his enviable reputation on the gridiron) could also be a budding Michaelangelo. It was indeed a pleasant afternoon we spent together (one of our last) — not only because I saw and enjoyed his pieces, but more importantly, because I witnessed the joy, warmth, and enthusiasm the experience provoked in his soul; and I knew that he planned on exploring and expressing his artistic side for the rest of his life.